John Hills, Lieut. 23d. Regt. & Asst. Engr., SKETCH of the POSITION of the BRITISH FORCES at ELIZABETH TOWN POINT after their RETURN from CONNECTICUT FARM, in the PROVINCE of EAST JERSEY. London: William Faden, April 12, 1784. Full early wash and spot color. Engraving, 24”h x 20 ¼”w at neat line plus margins. 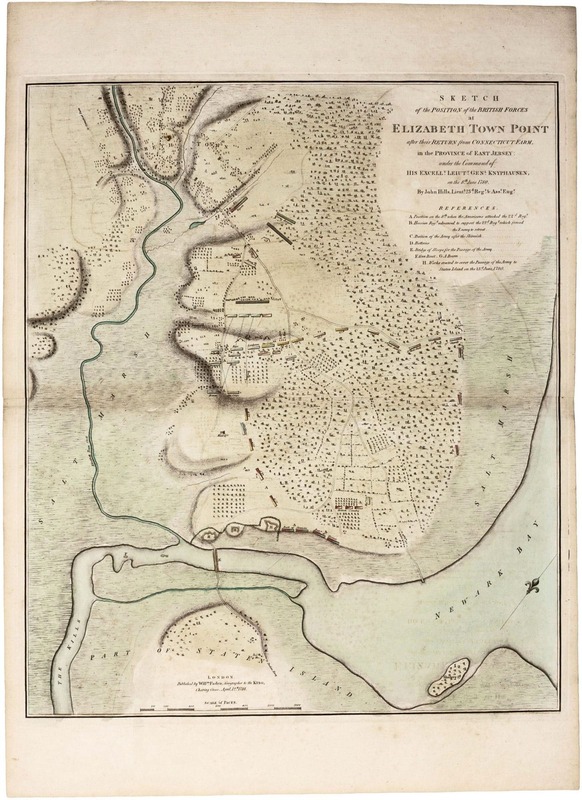 A very nice example of this rare and finely engraved plan depicting the action around Elizabeth Town, New Jersey in June 1780, after a manuscript by the great military cartographer John Hills. The engagement around Elizabeth Town consisted of two phases fought on June 8 and 23, 1780, during the last major British campaign in the northern theatre of the American Revolution. At the time the British held all of Manhattan, while New Jersey was controlled by American forces headquartered in Morristown. The situation was both tense and fluid, as the British were on guard for an American invasion of Manhattan, while the Americans in turn feared enemy attacks from across the Hudson. In June 1780 Lieutenant General Wilhelm von Knyphausen (1716-1800), a Hessian Baron who served as the British commandant of New York, decided to launch an invasion of New Jersey. On June 7 his force of 6,000, mostly German mercenaries, encountered sharp resistance at Connecticut Farms, New Jersey (just northwest of the area shown on this map) from a smaller American force under General Nathaniel Greene. Nevertheless, Knyphausen was able to proceed to Springfield Bridge, but the Americans managed to check him and to force him to retreat to the area of Elizabeth Town. The action portrayed on the map begins on the morning of June 8, 1780 with Knyphausen’s 22nd Regiment assembled in a defensive position near the marshes lining Newark Bay, as indicated at “A.” With the various British regiments carefully labeled and color coded, the map indicates how Knyphausen’s lines were forced to contract inwards in response to an American assault. However, the arrival of reinforcements (“B”) saved the British from having to give up further ground and enabled them to eventually occupy a better position on elevated land (“C”). Despite this lackluster performance, the British force remained a viable threat, as Washington’s army in Morristown was ill-prepared to face a well-orchestrated British assault. On June 23, the British again encountered the Americans at Springfield Bridge, but this time the former were decisively defeated, forcing them to make a hasty retreat to the relative safety of Staten Island across the improvised bridge depicted on the map at “E.” In sum, the British at Elizabeth squandered a real opportunity to gain control of New Jersey and thus threaten Washington’s plans to conclude the war on American terms. The map is based on a now lost manuscript by John Hills (fl. 1777-1816), one of the most talented and prolific cartographers of the Revolutionary War and a direct eyewitness to many of the events depicted on his maps. Hills served as Ensign in the 38th Regiment and later as a lieutenant in the 23rd. His abilities were greatly valued by his superiors, though his mercurial personality frequently led him into altercations with fellow officers and civilians alike. 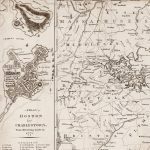 His greatest work was a manuscript atlas of 20 maps of parts of New Jersey produced in 1780 for the British Commander-in-Chief, Sir Henry Clinton, now preserved in the Library of Congress. Included in this atlas is a Plan of the Road from Elizabeth Town Point to Elizabeth Town: Shewing the Rebel Works Raised for Its Defence, which shows the battle site immediately prior to the first action of June 8, 1780. That map was presumably used in preparing the manuscript on which the present map is based. Following the war Hills settled in Philadelphia, and existing documents show that as early as 1788 he was working as professional draftsman and surveyor. In 1796, with the support of Philadelphia’s mayor, Matthew Clark, Hills completed the most important survey of the city of the Post-Revolutionary generation. This was published as A Plan of the City of Philadelphia and its Environs (Philadelphia, 1797), and is today a landmark of early American urban cartography. William Faden (1749-1836), the Geographer to the King, ascended to the apex of the London map world based on his groundbreaking cartography of the American Revolution. Faden included the present map in his exceedingly rare Atlas of Battles of the American Revolution (London, 1784), although some examples were also issued separately. Guthorn, British Maps of the American Revolution, 57/16 & 43; Nebenzahl & Higginbotham, Atlas of the American Revolution, #33. Nebenzahl, Bibliography of Printed Battle Plans of the American Revolution, #146. Sellers & Van Ee, Maps and Charts of North America and the West Indies, #1291. See also Augustyn & Cohen, Manhattan in Maps, pp. 88-89. Owned in partnership with Martayan Lan. Slight offsetting and discoloration along centerfold, else excellent.